Excellent for general purpose sketching and drawing when a dense shiny, smudge proof stroke is needed. They are oil based and therefore water resistant. 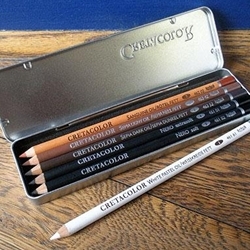 A complete pocket tin set of 6 Artist's oil pencils. Nero black soft and x-soft, White, Sanguine, Sepia Light and Dark.